XPOWER Industrial Confined Space Ventilator Fans come with variable speed control, letting you manage both air velocity and volume. These units provide air to small confined spaces when used with an 8" or 12" diameter flex hose. Capable of ducting air up to 125 feet. Confined Space Ventilators can be used to ventilate, create negative air pressure or to assist in drying applications. Ideal for delivering fresh, continuous air to manholes and sewers. Confined space fans are lightweight and compact and can be used without a hose to create high volume circulation in gyms, hallways, and other large areas. Duct Hoses available in 8" or 12" diameter. Great for delivering dry air to ventilate, assist in the drying process, or create negative air pressure. I need a replacement part for a model X-8 confined space blower. XPOWER Industrial Confined Space Ventilator Fans come with variable speed control, letting you manage both air velocity and volume. These units provide air to small confined spaces when used with an 8" or 12" diameter flex hose. 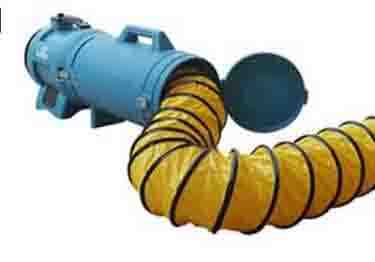 Capable of ducting air up to 125 feet.